25% of the weightage will be taken from intermediate public examinations(only groups) and remaining 75% from Eamcet. Including practicals the total marks of groups is 600 in which 25% of the marks will be considered. In EAMCET 75% of the total acquired marks out of 160 will be considered to calculate the rank. 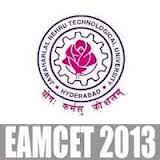 Students who aquire 25% of marks in EAMCET i.e., 40 marks are eligibe for EAMCET. The above said rule is not applicable for SC & ST students though their EAMCET score is "ZERO" they will be alloted ranks according to their IPE marks.